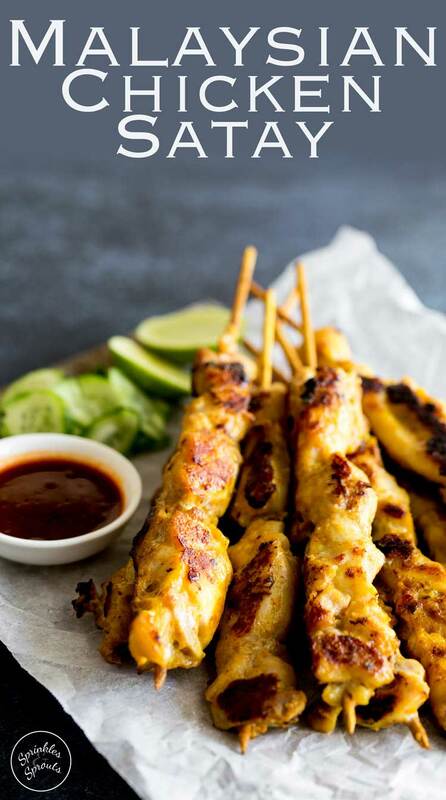 This Malaysian Chicken Satay, is delicious, simple and the perfect finger food for watching the big game, or sitting out watching the kids swim whilst you cook out. Or just serve them up in the middle of winter and dream of summer nights. 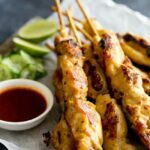 The marinade is super simple and if you follow my top tips for mixing up the marinade and freezing the prepared satay sticks, you can grab the tupperware box from the freezer in the morning and it will defrost and marinade ready to cook for dinner. But this week I knew I had the perfect recipe for the theme Labor Day Menu Ideas. Labor Day has been a national holiday in the states since 1894 celebrating all the contributions and accomplishments of the workers who have built the United States. Its also the last day of summer, so what better way to celebrate than getting the grill going! 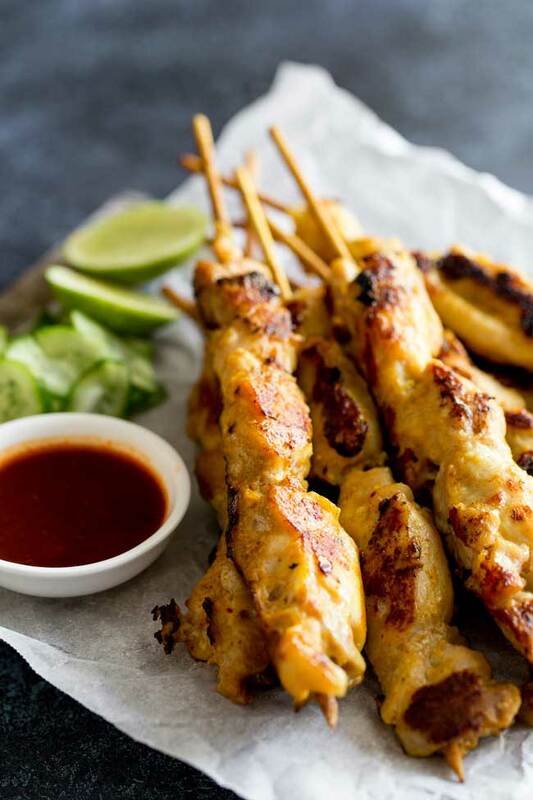 This Malaysian Chicken Satay is easy to eat without a plate, so moorish that you reach for another and equally delicious hot from the grill and as they cool sat on a food table. Get your friends together, get the a back yard game of footie going and enjoy some fabulous food with friends. For more Labor Day Menu Ideas, scroll down past the recipe and you will find links to all the other #SundaySupper bloggers recipes. I am super excited to try so many of them but especially the Greek Burgers with Feta and Tzatziki Sauce and the Foil Pack Grilled Potatoes. YUM!!! 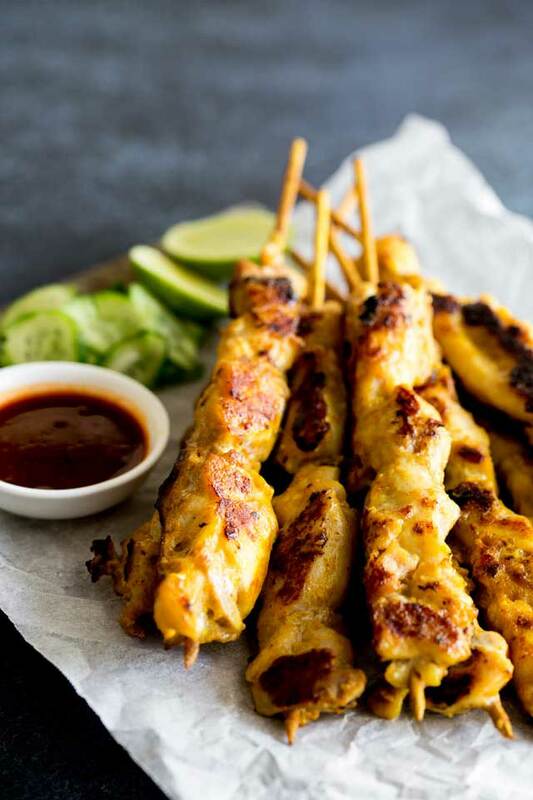 This Malaysian Chicken Satay is addictive, a wonderful mix of spices, salt and sugar are all mixed together, giving the chicken a wonderful colour and flavour. Then the chicken is grilled until tender and slightly charred. That charring adds a delicious smoky sweet savoury hit to the chicken, so don’t worry if the edges get a little black. This does mean you need to soak the wooden sticks to help prevent them burning. But if you are using my marinade, freeze, defrost and then cook method you will find the skewers don’t burn too badly. Or buy some metal skewers if you are always having skewer malfunctions 😉 ….actually scrap that!!! That involves more washing up and no one wants to do that on a public holiday! Remove the woody root and the outer skins of the lemon grass and then cut into small chunks. Peel the garlic and red onion and cut into rough chunks. Add these to a food processor and whizz until you have a thick pulp. Add in the ground coriander, fennel, turmeric, brown sugar, salt and coconut oil. Cut the chicken into big chunks and coat in the marinade. 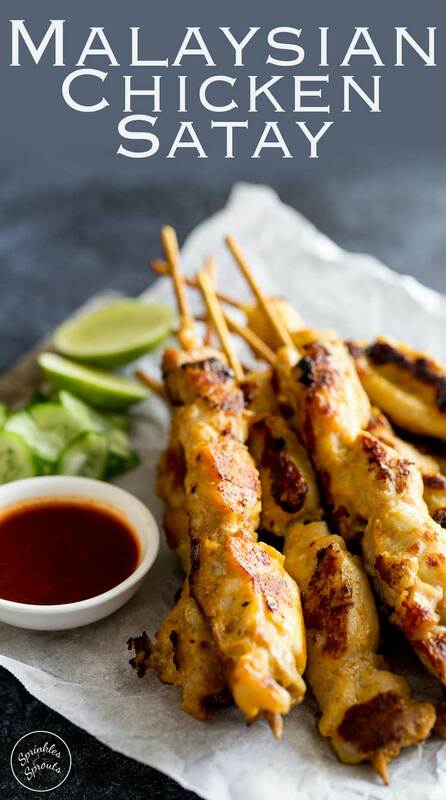 Skewer the chicken onto wooden skewers and place in a lidded tupperware with all of the marinade. Alternatively freeze until needed, they will continue to marinade as they freeze and defrost. 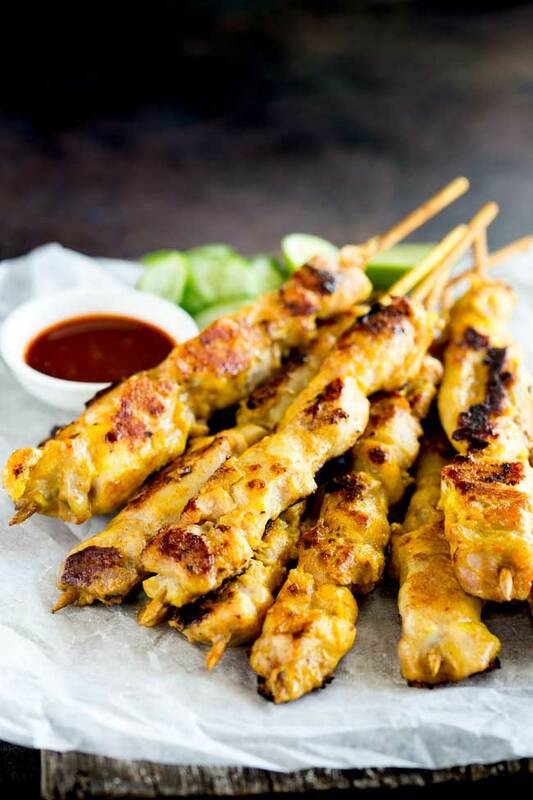 You can cook these satay on the BBQ or on a grill pan inside. Either way cook with a high heat for 2-3 minutes on each side. Remove from the heat and let them sit for a few minutes before serving. For more Labor Day menu ideas check out my fellow #SundaySupper bloggers, and special thanks to Christie from A Kitchen Hoor’s Adventures for hosting. This looks awesome and delicious. However, I do believe is Nasi Lemak instead of Nagi Lemak. Silly spell check. I have a friend named Nagi so it recognises that! Will change it now in the post! I love the flavors you have going on here, Claire! 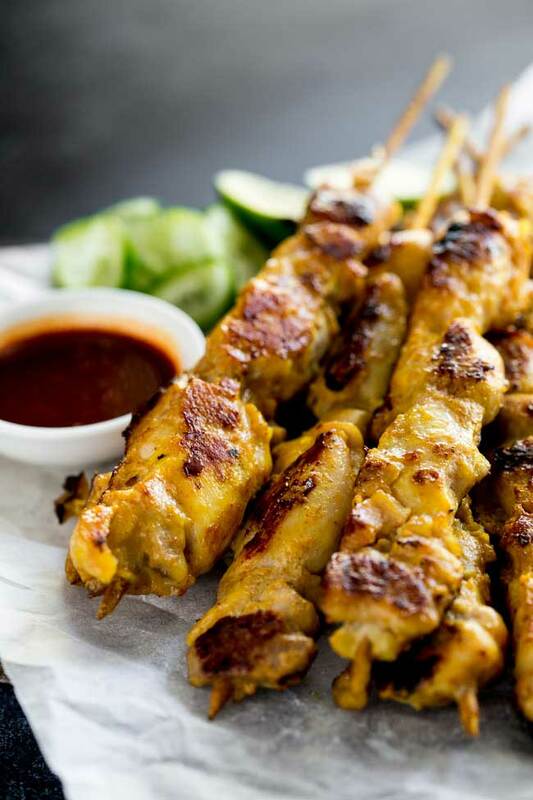 Satay is always a fun meal! 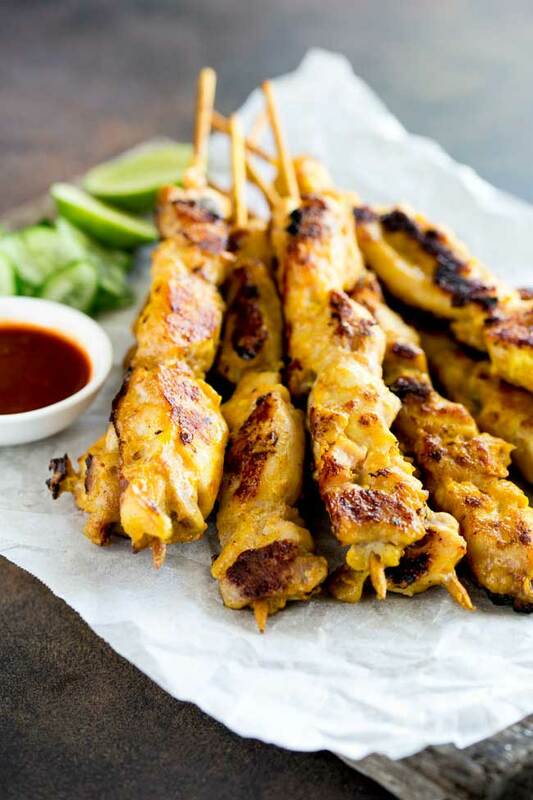 Mmmmm….I love all the spices in your chicken satay! What a delicious dish to add to our dinner menu!